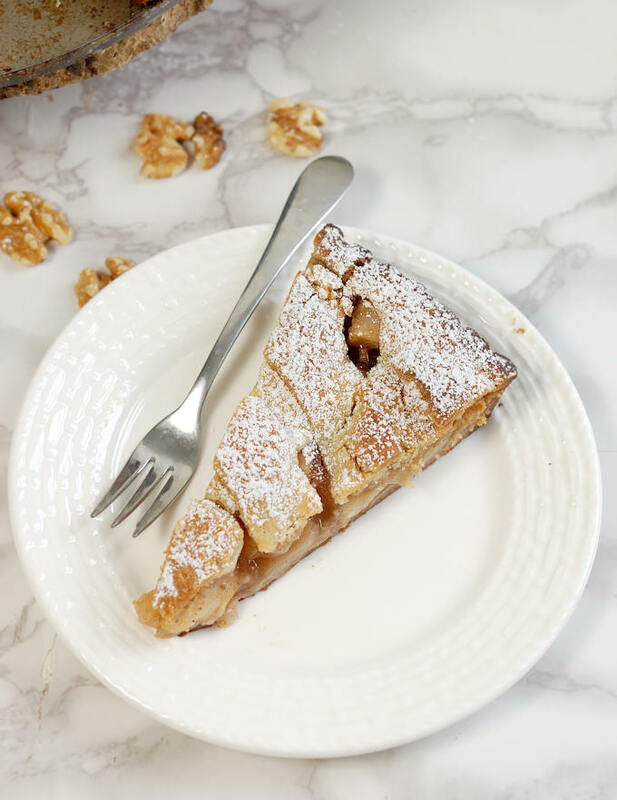 Apple Walnut Linzer Tart is a twist on the traditional raspberry-hazelnut tart. 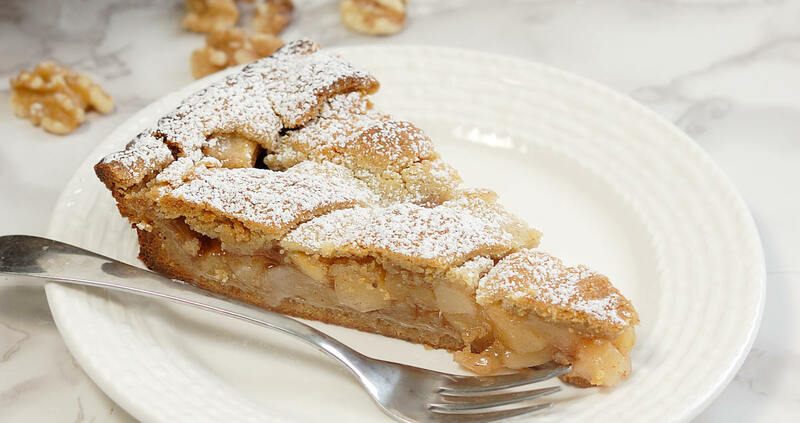 The crust is made with walnuts and the filling is made with fresh apples and cinnamon. 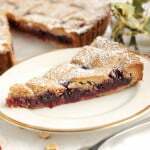 Linzer Tart, traditionally made with a hazelnut crust and filled with raspberry preserves, is a wonderful, warming dessert. 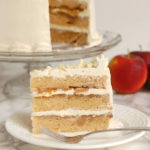 I have taken the essence of the traditional recipe and switched up the flavor profile with walnuts and apples. 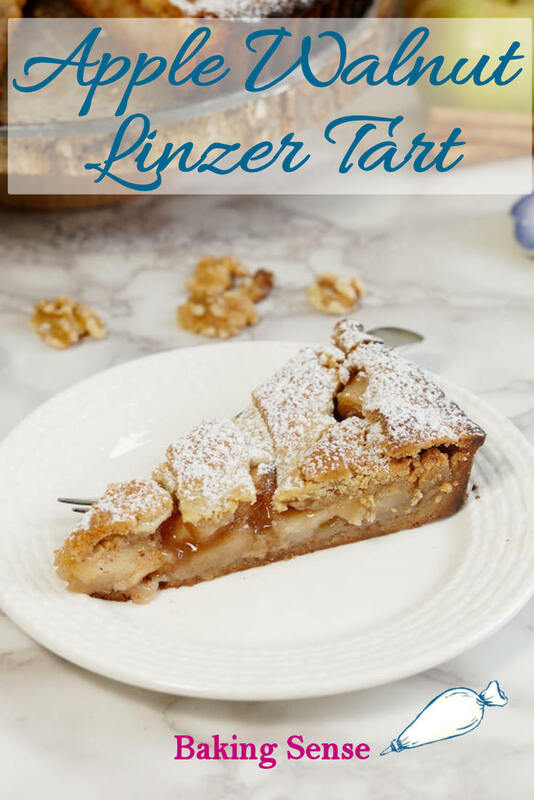 These are wonderful fall flavors, of course, so Apple Walnut Linzer Tart would be the perfect dessert for any fall get-together or holiday dinner. The filling for this recipe is pretty straight-forward. 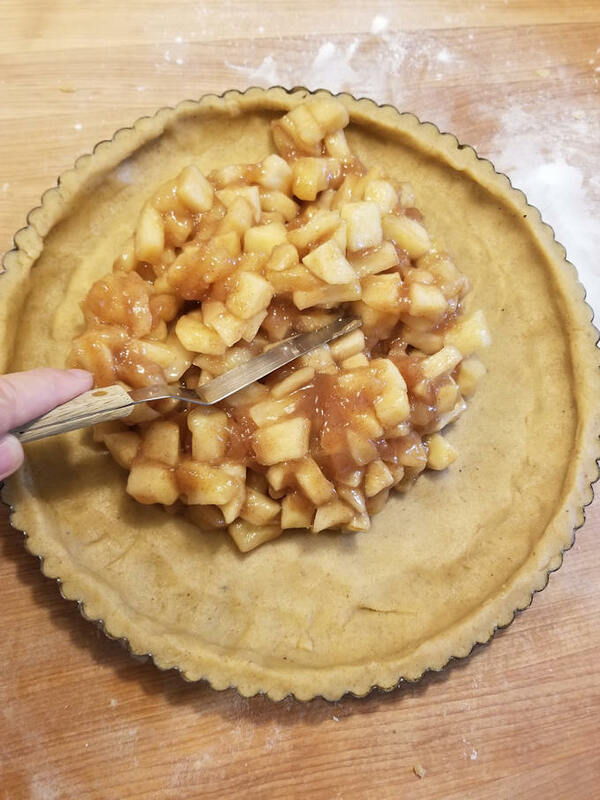 I precook the apple filling so the juices from the apples don’t make the crust totally mushy in the oven. 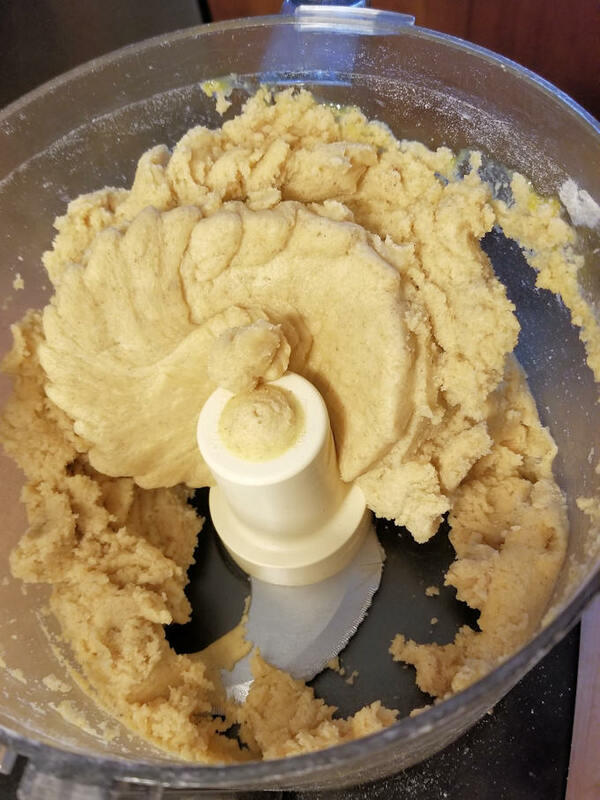 The dough is super-easy to make, since the food processor does all the work. But it is, admittedly, a bit of a pain to get that dough into the pan. See the helpful hints below before rolling the dough. The good news is, it will all bake together in the oven. 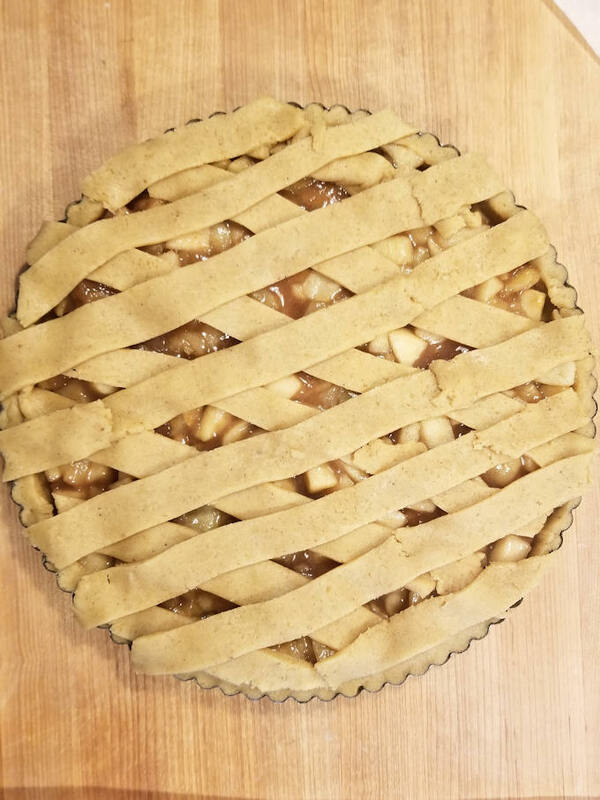 Even if the lattice doesn’t look perfect, a generous sprinkle of powdered sugar will hide any imperfections and create a tempting finish for your creation. 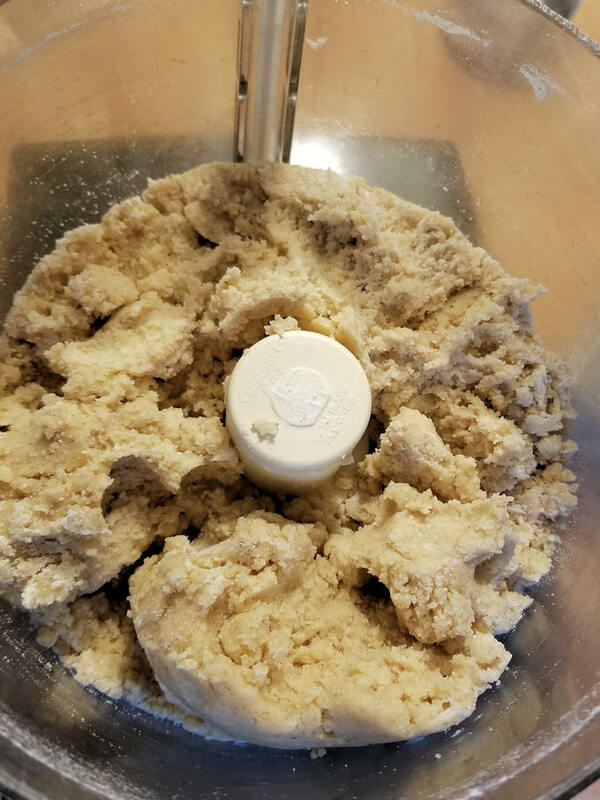 Grind the walnuts with a little flour. After adding the sugar, spices, butter and flour the mixture looks like wet sand. Add the yolks and process until the dough forms a big clump. Add the cornstarch to the apples and cook until the juices thicken. Roll the dough between two sheets of parchment, or press the crumbs into the tart pan. Use the parchment to transfer the dough into the pan. Spread the cooled filling into the crust. Use a pizza cutter or sharp knife to cut strips of dough. 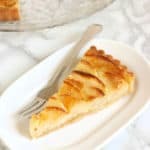 Use a small spatula to life the strips onto the tart. It’s ok if the strips crack as you place them on the tart. They’ll glue together as they bake. Allow the tart to cool completely before removing the sides of the pan. 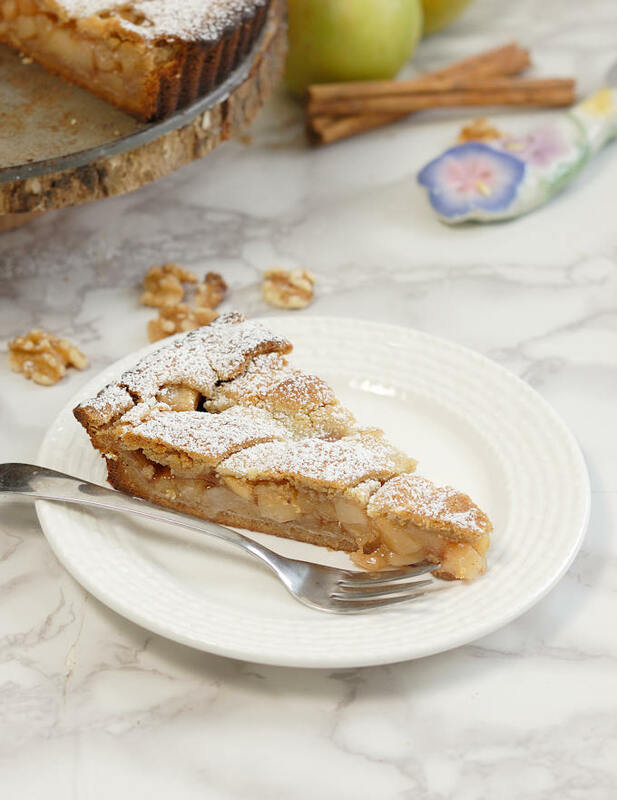 Use a fluted tart pan with a removable bottom for this recipe. The removable ring makes it much easier to get the tart out of the pan. I just serve the tart with the bottom of the pan still in place. The dough for this tart is very tender. I find it easiest to roll the dough between two sheets of parchment paper. Alternatively, you can sprinkle chunks of dough into the pan and press them into place. 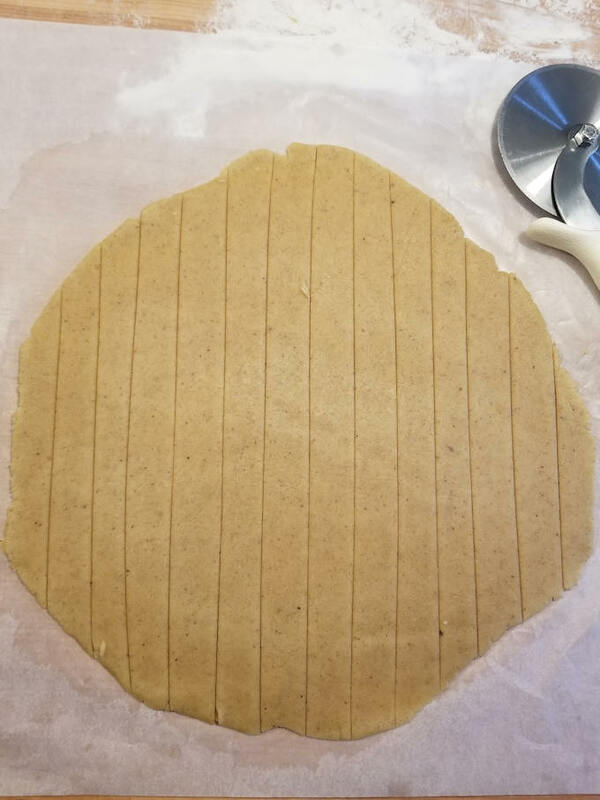 For the lattice top I like to roll the dough between two sheets of parchment then use a pizza cutter to cut strips of dough. 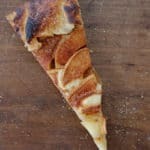 I use a small spatula to lift the strips onto the tart. Some of the strips will probably break. I just piece them together. You can refrigerate the strips before transferring them to the tart to make them less likely to crack. Alternately, take a small ball of dough and use your hands to roll it into a rope. Lay the ropes over the tart to form the lattice. Macerating the apples will prevent them from completely breaking down and becoming like apple sauce. See this post to read more about the science behind macerating fruit. 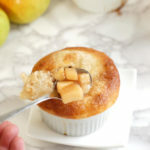 Granny Smith apples are a good choice for baking. In general, you want an apple that is very firm and has a good balance of sweet and tart flavor. Bake the tart on a sheetpan in case any juices boil over. 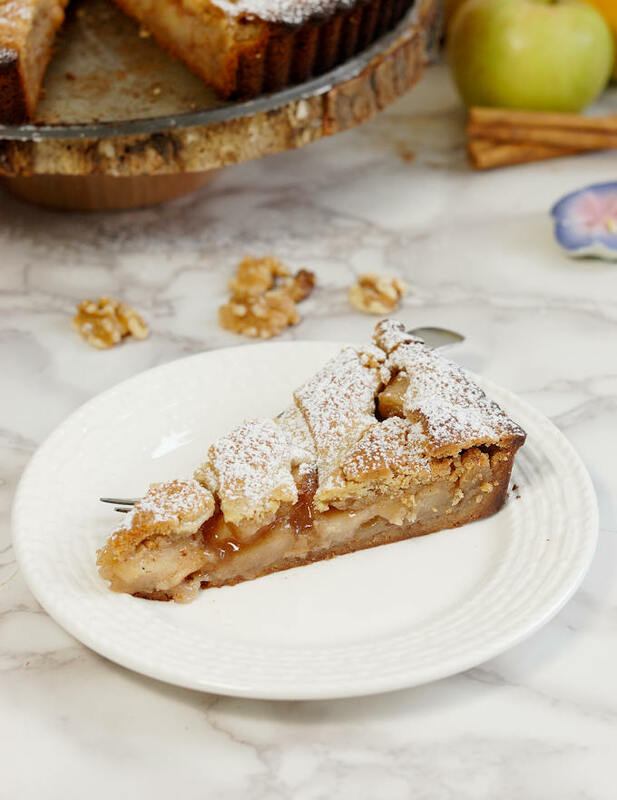 This tart is best the day it is baked. It will keep for a few days in the refrigerator. The crust will soften after the first day. A twist on the traditional raspberry-hazelnut Linzer tart. 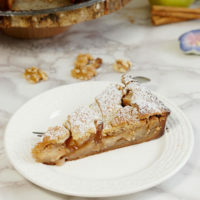 The crust is made with walnuts and the filling is made with fresh apples and cinnamon. Put the apples and the rest of the juice in a large saucepan. Cook over medium-high until the juices begin to boil. 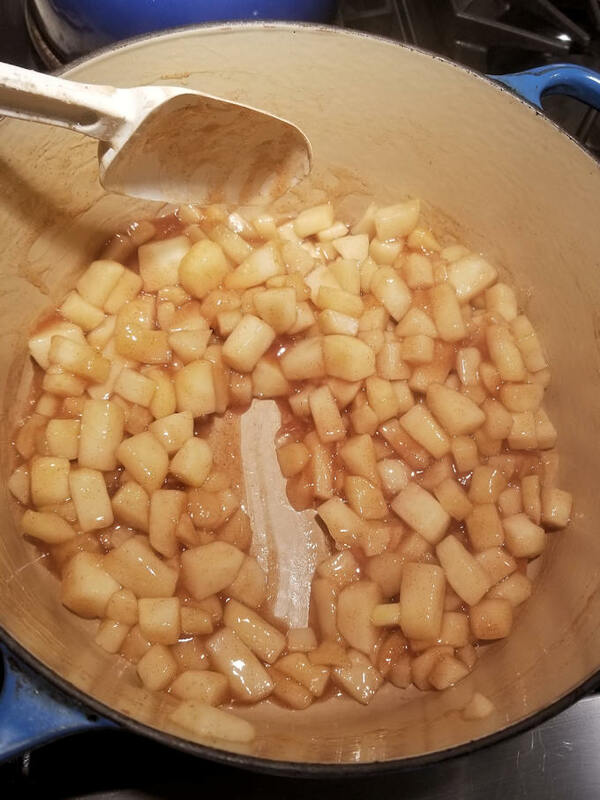 Reduce the heat to medium-low and continue cooking until the apples are crisp-tender, stirring often. Don't overcook the apples. They should still have a bite to them and should hold their shape. How long they take to cook will depend on the type of apples. Estimate 10 minutes. Add the corn starch mixture to the apples. Increase the heat to medium-high and return to a boil, stirring constantly. Cook until the juices are thickened and become translucent. 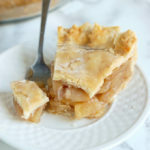 Transfer the apple filling to a container and cool to room temperature. Chill until ready to use. The filling can be made 2-3 days ahead. 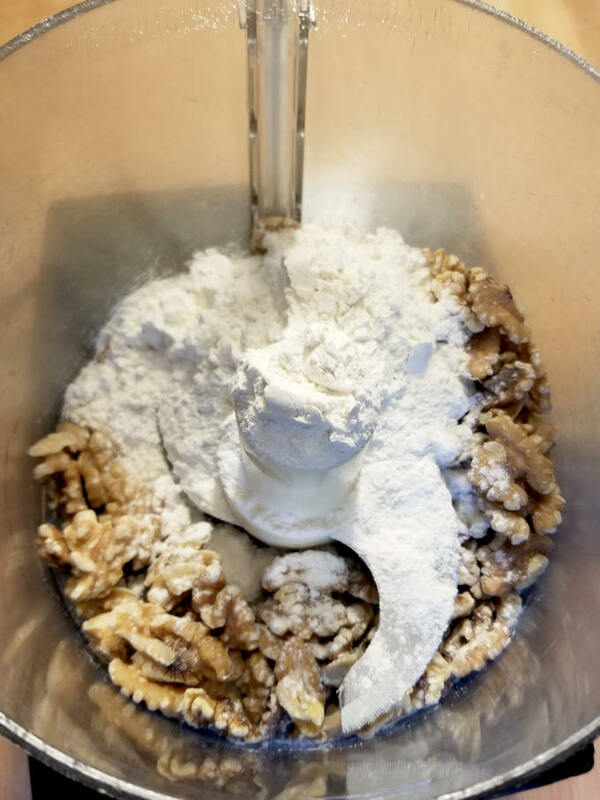 Combine the walnuts and 1/2 cup flour in a food processor. Pulse until there are no chunks and the nuts are finely ground. Add the sugar, baking powder, salt, and cinnamon and pulse to combine. Add the butter and pulse until the pieces of butter are no larger than a pea. Add the flour and pulse until the mixture looks like wet sand. Add the yolks and vanilla and process until the mixture begins to form a ball. Dump the dough onto a floured surface and knead until the ingredients are completely combined. Divide the dough into 2 unequal portions (2/3 & 1/3). Wrap each piece of dough and refrigerate for several hours until firm. The dough can be made 2-3 days ahead of time. 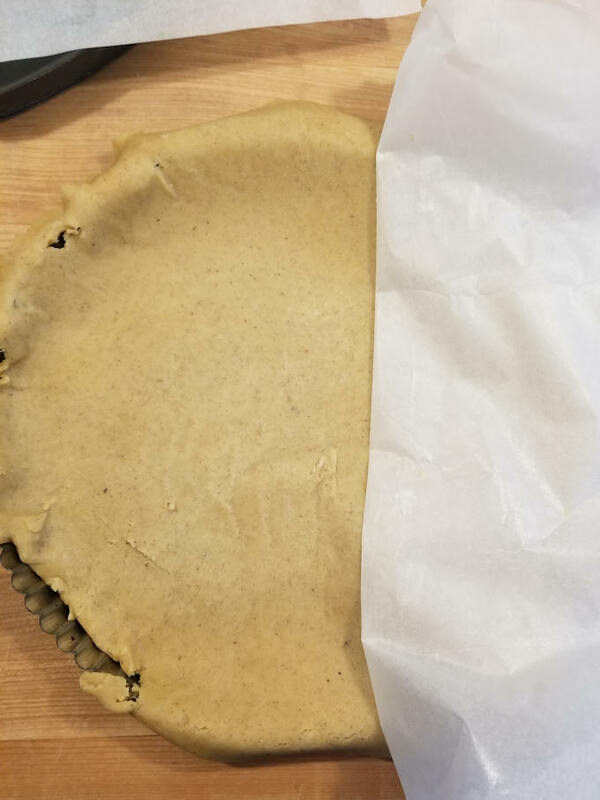 Roll the larger portion of dough between two sheets of parchment paper to fit a 12" tart pan with a removable bottom. Piece together any bits that crack off as you transfer the dough to the pan. (see note) Spoon the apple filling into the tart shell. 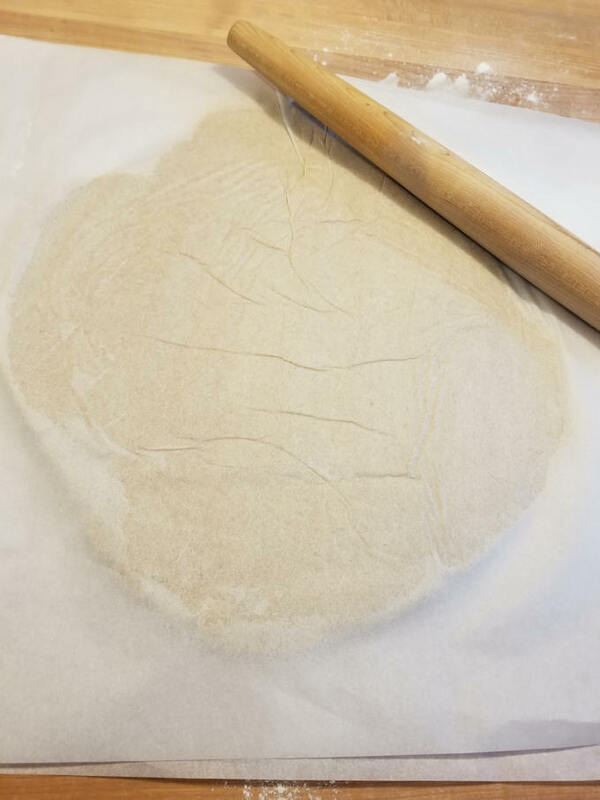 Roll the remaining portion of dough between two sheets of parchment to a 12" round. Use a pizza cutter or sharp knife to cut the round into 1" strips. Use a small spatula to lift the strips onto the filling (see note). Arrange the strips in a lattice pattern and press in place to stick to the edges of the pan. 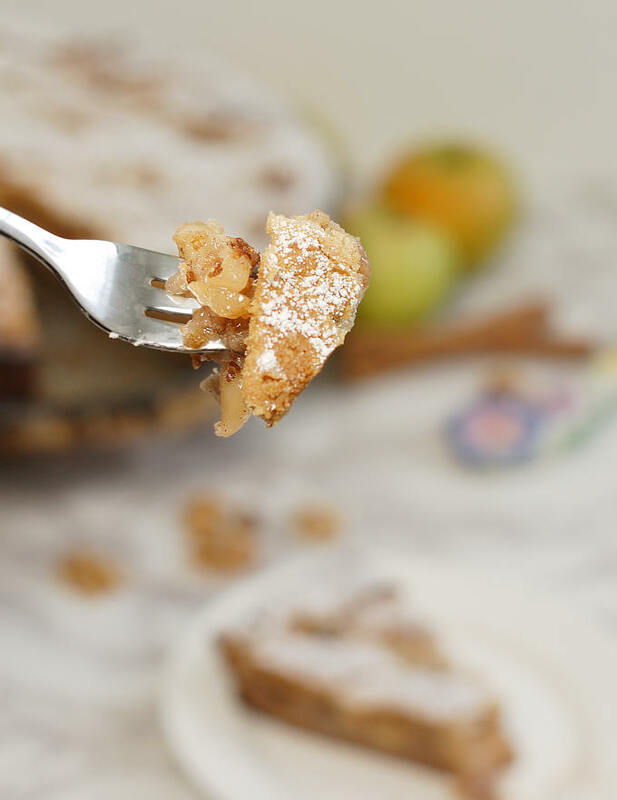 Use a small knife to trim the edge of the tart flush with the pan. 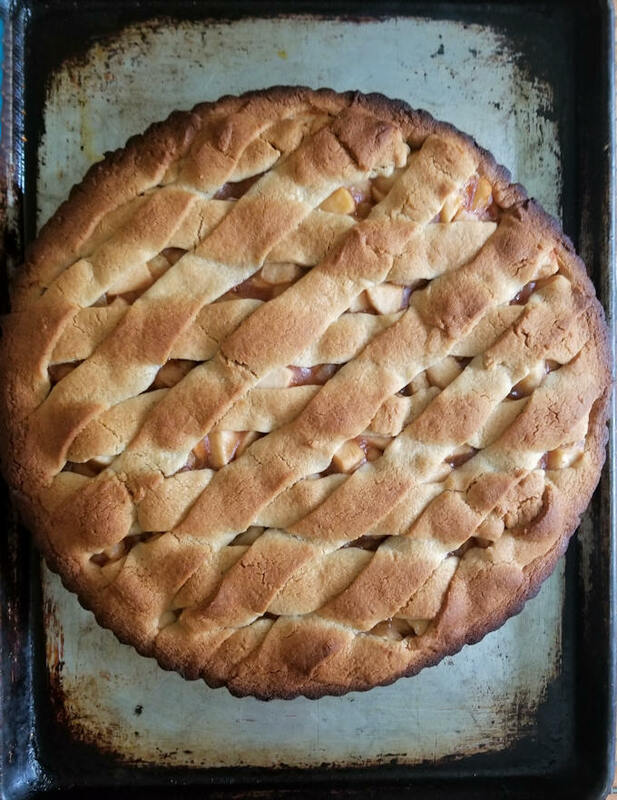 Bake until the tart is golden brown and set in the center, about 40-45 minutes. Cool completely before removing the pan rim. Sprinkle with powdered sugar before serving. Serve slightly warm or room temperature. The tart will keep several days in the refrigerator but is best the day it is made. Alternatively, you can sprinkle chunks of dough into the pan and press them into place. Alternately, you can take a small ball of dough and roll it into a rope for each strip of the lattice.